The exhibition “Baba Bling” refers to the Babas who are descendants of Chinese communities that are integrated from the fifteenth century in the region.This presentation could also be called “Identity and Openings “: how an immigrant community creates a unique culture by blending its culture of origin with what she finds out in her adopted country. Penang and Malacca in Malaysia, the city-state of Singapore, are the centers of the civilization of the Straits Chinese. In Singapore, “Peranakan” refers to all immigrant communities because the Indian and Eurasian components have played a significant role, but the exhibition in Paris is limited to groups of Chinese origin. The presence of Chinese migration in Malacca is very old; the British colonization of the island of Penang in 1786, the foundation of Singapore, the economic development of the region following the opening of the Suez Canal, all these elements promote a Chinese immigration, mainly from the Fujian province in southern China, which increases after 1850. The Babas feel very different from these new migrants, their Chinese culture has been enriched by numerous contributions especially fom Malay dress, food and traditions. They consider themselves close to the British, and imitate the English settlers and, when they can afford it, send their children to study in the UK. Their relations with China and its political evolution in the early twentieth century are very ambiguous. The economic role of the community, ethnic group, but also social class, is considerable and a significant share of the economic activity is under their control. The occupation of Singapore and Malaya by the Japanese is the end of this golden age and the independence of Malaysia and Singapore is not an additional opportunity as the Babas do not play a major role. Adapting to the modern world was difficult, and this culture was in danger but is now well protected in Singapore, much less in Malacca, where tensions between Malays and Babas will lead to some imigration to Australia. An outstanding presentation, even better than in Singapore The recreation of parts of the traditional houses: kitchen, bedroom, is very spectacular.A presentation around festivals and logical grouping of objects (jewelry, slippers decorated with beads, ceramics) is sometimes even more attractive than in the Peranakan Museum in Singapore. It is a pity that architecture is forgotten because the design of these traditional houses with several long, narrow interior patios is very spectacular; the same goes for the streets of Malacca and Penang which are very original specially with the buildings of clans or foundations. 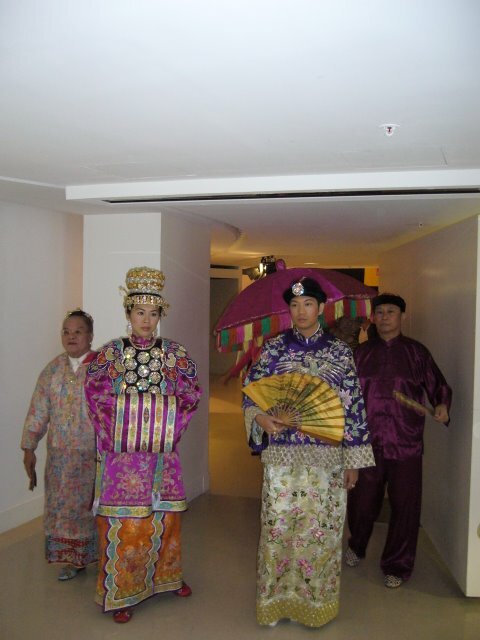 The exhibition is accompanied by a parade of a traditional wedding with beautiful costumes; conferences, performances, activities for children are also organized. The wonderful cuisine of Malacca, a major cultural element must be valued, there is only one Malaysian restaurant in Paris, even if it is good, it is not specialized in the nyonya kitchen and one must go London to enjoy it. This Baba culture in Singapore is important. It helps to give roots. 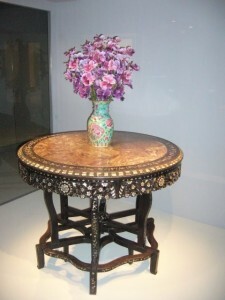 It has become “chic” to show one’s economic success by a collection of furniture and nyonya ceramics, which were manufactured in Jingdezhen in China with unique patterns and colors. These objects are now reaching exorbitant prices. Also a literature which is not known in France because it is not translated. But we can buy the excellent selection of books from the exhibition store. Unfortunately, the book by Vyvyan Loh is not available anymore and the novel of the Malaysian Tan Twan Eng, about Penang during the Japanese occupation, has not yet been translated into French. Photos: Baba wedding and furniture in the exhibition of the Quai Branly museum (Bertrand Mialaret). ► “Baba Bling – Signs of domestic wealth in Singapore” Musée du Quai Branly 37 quai Branly, 75007 Paris – until 30 January 2011.